You may want to and to add personal or team Events to your TeamSupport Calendar. Events might include Projects dates, Onsite Customer visits, User Vacations, and Support Rotation schedules. Begin by choosing a Calendar view. Depending on which Calendar you choose, your Event will automatically become associated with that object. Main Calendar – From the left hand navigation, browse to Calendar. Displays all of the events that are visible to you. Group Calendar – Displays all of the events that are associated with the selected Group. Ticket Calendar – Displays all of the events that are associated with the selected Ticket. Customer Calendar – Displays all of the events that are associated with the selected Customer. Product Calendar (Enterprise Only) – Displays all of the events that are associated with the selected Product. *Please note that User Rights apply to all of the Calendar views. 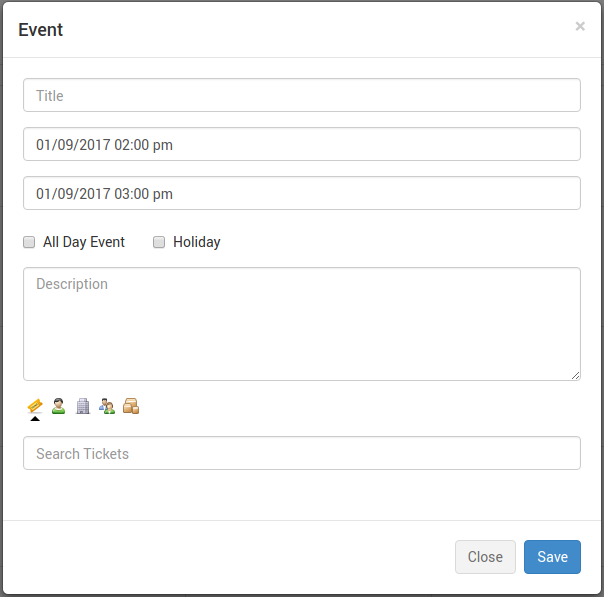 This means that if an Event is associated with a Ticket, Group, or Customer that a user does not have access to, that Event will not appear on their Calender views. Title: This title will show up on the Calendar display. This field is required. Start and End Date/Time: These two fields allow you to enter a start and end time and date. All Day Event: This checkbox will indicate that the event will last all day. Time fields will be removed from the previous two fields. An All Day Event may span multiple days. Holiday: A holiday event will appear as an all day event in your calendar with a green background. You can use your Holidays to “pause” your SLA timers. Description: The description field allows you to enter additional information for your event. This field is visible when you choose to “view” the event after it has been created. The real power of the TeamSupport Calendar is when you make associations to Tickets, Users, Companies, Groups, and Products. To integrate this Event into other areas of TeamSupport, you may associate the Event with a Ticket, User, Company, Group, or Product. Associate Ticket – Search by either name or number to associate a ticket. This will cause the Event to display on Calendar section of the Ticket. Associate User – Associating a user will give only you, and the associated users visibility to the Event. If you associate the event to yourself, it will only be visible to you. Click here to learn about Managing Events.